Plug-ins that are compatible with Adobe Photoshop (tm) 6 and earlier will work but be aware that plug-ins are from a wide variety of different 3rd parties. You should only use plug-ins from a source you trust. In addition the quality level of 3rd party plug-ins can vary greatly. Configure the location of your plug-ins with the Select Plug-In Folders button. This only needs to be done once. 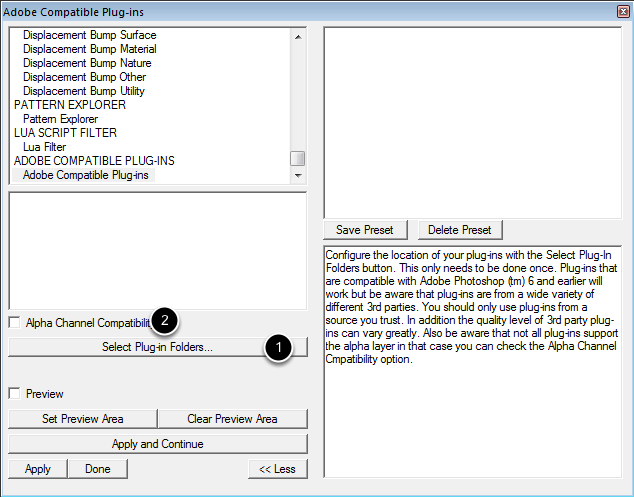 Not all plug-ins support the alpha layer in that case you can check the Alpha Channel Compatibility option.